Your company website represents the hub for your digital presence. It's the digital equivalent of your office, showroom or retail store, available 24/7 and whenever your prospective customers decide to research you. A majority of customers (70 to 90% depending on your source) start their purchase process online. If you don’t appear in their search results, how can you expect to ever connect with them? The solution is a website that supports your business goals with content relevant to your customers, which is published regularly and consistently and also optimized for search. It’s a site that recognizes that not all visitors reach your site ready to buy. If they aren’t, you want a means for engaging them and getting them to revisit your site on a regular basis. Finally, you need to be able to measure what you do on an ongoing basis so you can improve consistently and continuously. 1. Get found online by prospective customers as they started their buying process online. 2. Offer Calls to Action with content offers to generate leads. 3. Engage in lead nurturing to build relationships and eventually convert leads into customers. In so doing, the businesses featured in these case studies embraced Inbound Marketing. >> Read What Goes Into An Inbound Website Redesign? Not all businesses approach website redesigns the same way. Some opt for a complete redesign, where little more remains from the original site than some content, and others for major or gradual changes to an existing site, which still retains some of its look and feel. We see website redesign as a continuum based on the business goals associated with the redesign itself. To give you a sense for the benefits associated with a website redesign that embraces inbound marketing to get found online - including improved SEO (search engine optimization) - here is a website redesign we were responsible for in 2008 - before dynamic websites became the norm. 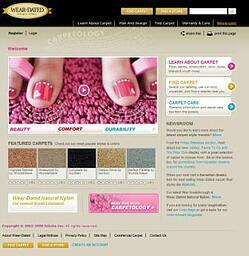 Whittemore developed the vision and strategy for the redesigned Wear-Dated carpet fiber website as a result of her experience with social media marketing and creating content for the web. Not only was the new website social media friendly, allowing sharing, commenting and ratings. It was also search friendly, content rich and easy to administer, making keeping the site evergreen simple. Within a short period of time, the site ranked high organically on select key words. 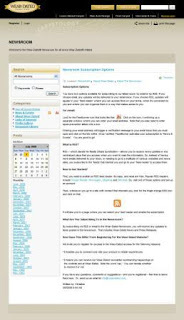 The new website was launched on June 1, 2008. This case study explores the steps taken. The previous WearDated.com website hadn't been updated in three years. Because it was primarily flash based, we could neither update content nor our retailer database without expending significant resources. Furthermore, navigation was difficult and unintuitive; using the website to support activities in the marketplace wasn't possible; and the site had little organic visibility, depending heavily on PPC [Pay Per Click] campaigns. We needed to update the website not only to reflect our new By The Foot marketing positioning, but also to direct consumers to retailers selling carpet made with Wear-Dated carpet fiber. The original website redesign concept consisted of updating the look/feel of the site and address the critical issues preventing timely retailer database updates. However, was more possible? In January 2007, Whittemore attended Future Now's Online Copywriting seminar led by Holly Buchanan (during which she met Bryan Eisenberg, co-author of Waiting for Your Cat to Bark? : Persuading Customers When They Ignore Marketing). During that session, she became convinced that the site could be improved and made more visitor friendly in tone, content and navigation. A social media friendly content management system would improve organic search results and benefit the brand considerably more than a cosmetic update would. Whittemore further analyzed the site, proposing a more dynamic website approach for the redesign, and volunteered to be part of the website redesign team. She envisioned a site more consumer friendly in its tone and approach, with content that truly demystified and simplified the carpet purchase process, an administrative interface that allowed frequent updates of content and data, and a blog platform for dynamic content about the brand, new carpet products and carpet retailer-specific consumer promotions. 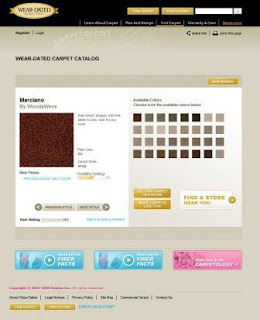 >>The goal was a website that engaged consumers searching for carpet related information and connected them to Wear-Dated carpet styles available at specific carpet retailers that they could then purchase. The website should also offer robust carpet care content and resources. Registered visitors could both review and rank products and retailers, offering consumers more value. 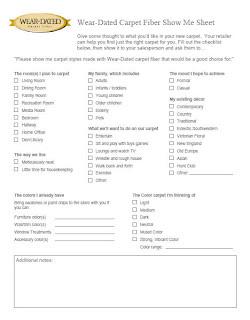 They would also receive our Newsletter with additional links and resources relevant to carpet. Website content was written in consumer friendly and relevant language. Robust search functionality supported the entire site. Google maps functionality enhanced retailer information. Visitors could easily share content. 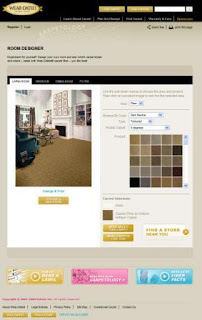 Furthermore, the site supported retailer promotional activities by featuring their carpet sales events in the Newsroom with appropriate keywords and tags, and carpet mills by featuring specific carpet styles made with Wear-Dated carpet fiber on the home page and search page on a rotating basis. The site allowed the brand to also offer coupons and run contests. The new website was self-administered and quickly led to significant savings by not having to rely on an IT department to upload changes and updates. Furthermore, the turnaround on updates was instantaneous, significantly improving content freshness and enabling the brand to quickly react to the kind of SERP results obtained above. We built the dynamic WearDated.com website on a DotNetNuke platform with flexible modules rather than building a static rigid framework from scratch. For a comparable cost, the brand obtained far more flexibility of design and administration, with a strong social media friendly framework with a bloglike newsroom, that enabled the promotion of carpet mill products and carpet retailers and generally offered more value to all within the community. Finally, this website redesign made the Wear-Dated brand more visible and relevant to consumers learning about carpet, shopping for carpet or wanting to know more about caring for their carpet. As a result of the redesign, Solutia successfully sold the Wear-Dated carpet fiber division to Mohawk in 2009. The description above gives you a high level picture of what we accomplished and how. Below, we share with you details on the supporting elements. By that, we mean the pages, features, content and other aspects of the website that this redesign included and which truly enhanced the user experience. In redesigning the Wear-Dated website, we wanted and needed the website to reflect the By The Foot campaign which is quirky, whimsical, really fun and puts the whole process of buying carpet, owning carpet and caring for carpet in a new framework. One that better reflects how women do things - like make decisions about what's going into our homes and how those decisions reflect our individual sense of style. Next, we wanted to create a different web experience. One that is more attuned to searches that start on a search engine rather than at a specific manufacturer or brand site and is also easier to interact with and share with others. 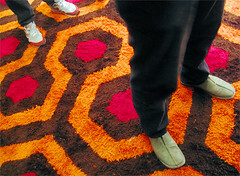 One that acknowledged how confusing the carpet category is and tried to make sense of it for visitors. In other words, we spent a great deal of time rewriting and refining our content so it provided meaningful information as you go about learning about carpet, finding carpet and carpet retailers, and then caring for carpet. We added printing and sharing functionality from every website page. Any page can easily be emailed or tagged via the social web. On the home page, we featured specific Wear-Dated products which vary over time and help tell the Wear-Dated story of Beauty. Comfort. Durability. Search was critical. We wanted visitors to be able to search from anywhere on the site. From the home page of the site, visitors could easily navigate to Learn About Carpet, Find Carpet or Carpet Care from three buttons on the right of the home page hero image. You could also navigate from the top pull down menus which will show you the sections to anticipate. Or Search by entering your search term in the box at the top right of the window. This website definitely considered how to stay connected with visitors beyond a first visit. Up in the top left hand corner, visitors could Register/Login to receive newsletters, rate and comment on retailer and carpet experiences and/or participate in upcoming contests and newsroom discussions. Registration consisted of an email address, a password, your name and a zip code. It included a box to check about the newsletter as you can maybe see in the image below. At the top right of each page, we included 2 icons. One that said print this page, and another to share this. The email option sent an email with a link to the page you found interesting, with a personalized message from you. Yes, this website redesign expressed humor. Between the bedazzled toes and the hot pick carpet - not to mention the whimsical find print - the visuals in the Wear-Dated site captured wonderful humor. 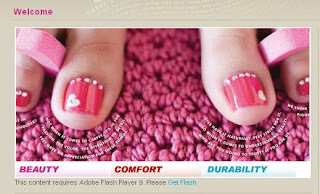 And, on the home page, we included some flashiness... Notice the toes? Those glamorous pink toes? Against that gorgeous pink carpet? If you clicked on the white arrow in the middle of the toes image, you would get to experience Beauty. Comfort. Durability. Note: Flash is now considered a no-no. Even then, if you didn't see an arrow, it meant that you were missing Flash. "This content requires Adobe Flash Player 9. Please Get Flash." Underneath that catchy pink graphic, featured selected carpet styles made with Wear-Dated carpet fiber. Clicking on any of those styles would take you to the carpet catalog where you could browse colors and see the carpet in a room. The stars below each item corresponded to ratings that visitors contribute. You could see those in more detail when you visited the carpet catalog pages. The Wear-Dated Carpet Catalog allowed you to easily browse through carpet styles, and the colors available in each style. As in a carpet retail store, we used a 'deck board' format where critical information about the carpet is readily available and visible in one location: the carpet style name [here, Marciano], the name of the carpet mill that created the carpet, the name of the color shown in the large swatch, the Fiber Line - i.e., the type of Wear-Dated carpet fiber, a description of the carpet style [here a shag], and a durability ranking for the style. Durability Ranking corresponded to the Wear-Dated® performance rating Wear-Dated obtained after testing carpet samples. It is based on an international test method known as Hexapod which evaluates appearance retention of carpet. The instrument used to test carpet is composed of a circular rotating drum with carpet placed on the inside. Also placed inside this drum is an eight-pound steel ball with six pods [hence the name 'Hexapod']. As the drum rotates, the ball falls on the carpet face, simulating footsteps.After the standard number of rotations, carpets are then assessed using the Carpet & Rug Institute [CRI] performance rating scale. Note that these ratings do not take into account soiling, poor maintenance or other factors of use; just the change of texture related to matting and crushing that might occur from walking on it. For these reasons, it is not practical to associate years of wear with the performance ratings. The virtual carpet deck board allowed you to easily evaluate carpet colors in the larger swatch format [in-store, the large swatch is often beige and the color line shown in small swatch sizes], and page back and forth from color to color. Or, simply select the one you liked from the thumbnail choices. The Carpet Catalog offered another benefit: visualizing the carpet in a room to better evaluate how it might look with furniture and in combination with different wall colors. So, from The Carpet Catalog, you could "See This Carpet In A Room" and go to a Room Designer where you could let your imagination run wild! When you reached the Room Designer from the Carpet Catalog, it would automatically take you to a room with your carpet. However, if you didn't like the room category choice, you could pick another [living room, bedroom, dining room, foyer]. Each category included several individual room choices. You could enlarge the room scene and print it. Or choose a new room. We offered the option to return to the Carpet Catalog via "More About This Carpet" or to consider other similar carpet styles via "More Carpets Like This." If you decided you didn't like the carpet style in front of you, you could click on "More Carpets Like This" and choose from others. When you were ready, you could go to the Retailer Locator to find a store near you. The new Wear-Dated website included a newsroom as well as a blog. The Newsroom differed from the rest of the site in that it offered different options in a different format located in a left sidebar. 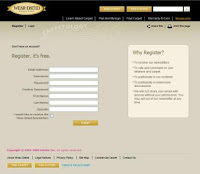 Explore 'about Wear-Dated' for reference information like What Is Wear-Dated?, The People of Wear-Dated, Corporate Social Responsibility, Wear-Dated Timeline, About The Newsroom and What's New at Wear-Dated? A Document Library with digital copies of printed resources. We've mentioned how complex the flooring purchase process is. It's confusing, hard to make sense of and an expensive purchase. Part of creating a site that simplified the process was offering helpful resources. The first was the 'Wear-Dated Carpet Fiber Show Me Sheet.' Consumers, designers and retailers had told us how valuable they considered this tool for organizing carpet buying thoughts. The document is simple, yet thorough.Its purpose is to organize your thoughts around what to look for in carpet and carpet styles to best suit your lifestyle and design preferences - before you walk into a store. So that when you do enter a store, you have better control over the conversation with your salesperson and the choices available. 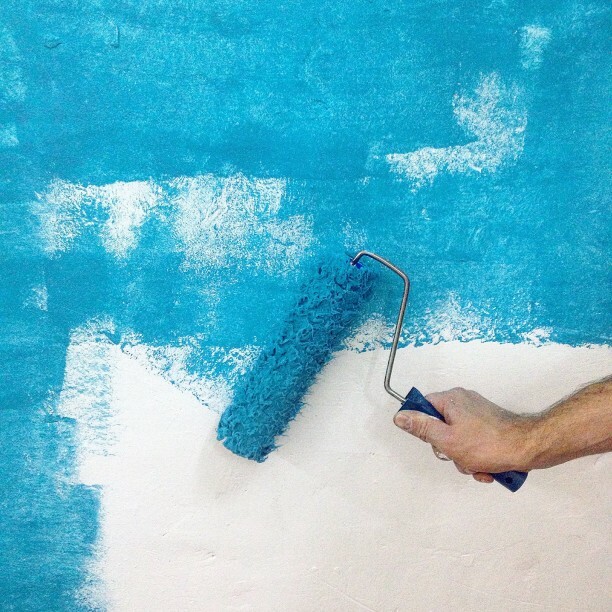 You can then detail which colors you already have in your room [it encourages you to bring swatches or paint chips with you to the store] and which carpet colors to consider. You can also add any relevant notes. 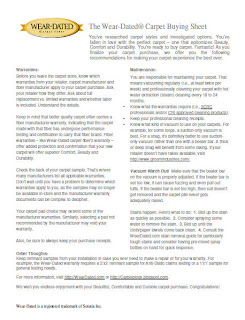 Next was the 'Wear-Dated Carpet Buying Sheet' consisted of tips, advice and questions to ask when you are ready to purchase carpet. The goal of it: to ensure that you have the best overall experience possible with carpet. It came about after discussing carpet complaints, and what types might be preventable. Many were. And consumers told us that they wished they had known beforethey had problems what they should have been doing. After all, carpet represents a major purchase - like a car or a major appliance. But, unlike those other major purchases, it doesn't come with a comparable instruction manual. Wouldn't you want to know ahead of time what is important for carpet care and carpet maintenance and carpet warranty compliance? I would. That's how the Wear-Dated Carpet Buying Sheet came about. Tips, advice and suggested questions to ask your retailer before you leave the store. Did you know that carpet often carries multiple warranties? From the retailer, the carpet manufacturer and – for better quality carpet – from the fiber manufacturer. [Note: Wear-Dated is a carpet fiber and we offer a warranty on carpet made with Wear-Dated carpet fiber.] The different warranties may differ one from the other in their requirements. They may also be affected by the carpet pad or cushion you purchase. Best to know ahead of time. The best time to determine which warranties apply is at purchase, by asking the retailer and noting details from the back of the carpet sample. And, how best to maintain carpet. Carpet must be vacuumed regularly [at least twice per week] and professionally cleaned every 18 to 24 months. But, did you know that certain styles of carpet [e.g., shag or some loops] prefer a suction-only vacuum? Proper maintenance ensures that carpet retains its beauty over time. How it is done will also affect a carpet owner’s warranty. Best to know ahead of time. Another important piece of advice: keep your purchase receipts. You may need them. originally uploaded by Happy Sleepy. "...every time a consumer shops for flooring, it's like the first time. Even if they've made a significant flooring purchase in the last five years, they need to learn about it all over again. And the place they want to do that is on the Web." Not surprising -- the web is where most turn to for information. But it's also daunting as flooring and carpet aren't always the easiest to connect with online or offline. For that reason, we thought we should remind you that, well... we're here. As you're looking for that perfect color, just the right style and the price that matches your budget, Wear-Dated has tools and tricks to help you find exactly what you're looking for, and help you make carpet buying decisions. We even have advice to help you care for your carpet after you've made your choice. FIND CARPET - Here, you can peruse thousands of styles and colors. We have everything from shag to loop, so you can narrow your choices down to specifics or broaden them to include everything that might be a possibility. DESIGN A ROOM - Let's say that you've narrowed it down to your top three options. Now you want to see what each of them actually looks like on a floor. Pick a living room, bedroom, dining room or foyer and view it with your favorite carpet made with Wear-Dated carpet fiber. It's easy and far less expensive than trying all three options at home. ESTIMATING CARPET - We know you want to visit your local retail store already prepared. Just measure the room you'd like to carpet, then enter your calculations here. We'll crunch the numbers so that you have a better idea what to expect when you make a purchase. CARING FOR STAINS - You're careful, but stains do happen. Use this handy-dandy reference guide to remove nearly all unwanted stains from your carpet. We also recommend the Carpet and Rug Institute's Spot Solver. NEWS & UPDATES - All carpet, all the time, delivered right to your inbox. Subscribe via email or RSS. How do you help those who are in the market for your product? We hope this case study helps inspire you to dream big about your customers and how you can truly share your expertise to help them with their purchase decisions.